I Skate, Therefore I Am: Say, you wanna work as a skateboard shoe tester? So, you really want to work in the skateboard business? You see, that’s a good idea, Board-Trac, the survey arm of the International Association of Skateboard Companies tracked the annual skateboard sales volume for 2004 at a whopping $5.2 billion and that was 6 years ago, chances are that, even with economy in the doldrums, sales will be least 20% more in 2010. Seems like with sales like that, there must be a lot of people working for the industry. And that’s an understatement! But, guys, guys, guys, bad news: not everyone in the skateboard industry is a pro skater. It is more difficult to get sponsorship than landing in Mars. Plus, you have to have the right authentic or exotic name, like Nyjah Huston, Chris Cole , P. Rod, Eric Koston or Ryan Scheckler or something similar and that is not an easy task because those names are already taken… In the skate industry, the pros actually represent the tip of the iceberg and the bulk of the skateboard jobs are rather in mundane positions like sales, marketing, shipping, warehousing, accounting, chargeback specialist and if you don’t know what chargebacks are, believe me you don’t wanna know! Sometimes, the skate companies post nice jobs, like photographer, web editor, skate park manager, graphic designer, skatepark instructor, social media specialist, blogger, email marketer… You know what a social media specialist does? He goes to Twitter and Facebook, make thousands of friends, write a couple of jokes and brag about the company all day long… How about skate park manager? You need to open the park everyday and make sure all the bowls, ramps and trannies are safe to ride, right? How ‘bout graphic designer? You spend your day drawing nice pictures that will end up on a billion decks with you name on it. Sole Technology at Lake Forest have an amazing department: they call that STI. You will never believe what these guys do all day long. They test skateboard shoes: they studies every skater’s landing and fall in order to get a better understanding and learn more about the movements and impacts incurred by action sports athlete’s bodies. They have a 10,000 square foot biomechanics research laboratory on-site which houses state-of-the-art testing equipment and a variety of obstacles like mini ramps, handrails, stairs, and ledges. They log hundreds of ollies everyday and record the jumps at a F-ing 1000 images per second and then they have a powerful computer software that model all of the pictures and try to integrate the data to make shoes more absorbent to shocks and resistant to thrashers… Do you know how it is to be filmed at 1000 frames/second? You can actually see a drop of sweat dripping from the forefront, slowly sliding in the cheek and dropping and exploding in 1000 smaller drops into the floor. It is skateboarding meet Animal Planet meet PBS meet the NASA. Job: sample dispatcher. Imagine you need to send brand new samples everyday to your reps, distributors, customers. Skateboard shoe tester, isn’t that a dream job? But, be careful. To be hired to those dream jobs, you need first to be good at what you are doing. If you can’t do an ollie, forget about the shoe tester position. If you can’t type, or if you don’t know that “elicopter” start with an H or that “I kan” start with C, you can kiss goodbye to the blogger, mail marketer or social media specialist positions. To land in one of those dream jobs, you also need to know all about the skateboard bizness. If you don’t know who Jim Fitzpatrick, Per Welinder, Steve Rocco, Pierre Andre Senizergues, Don Bostick, Tony Alva, Lance Mountain, Bruce Logan, Tod Swank or Jesse Martinez are, go google their names or forget about your dream job. And you need to know more than the basics: even if you are a champ playing Tony Hawks’s Ride on your TV you watch the Battle at the Berrics every day and you never miss the Dew Tour on ESPN or on Fuel TV, believe me, that’s not enough! Finally, if you don’t leave in Southern California, plan to move here or get lost as 90% of the skateboarding jobs are located in Orange County! The last advice on finding a skateboarding job would be to start your own friendly business. if you really love skateboarding that much, you know that much about it and you are willing to sacrifice your life for it, take out a loan from the bank and start a company. Gather a crew of talented friends and distribute the positions upon everyone's best skills (writing the business plan, customer service –also called hate mail-, shipping –which is going to Fedex before 5pm everyday-, etc…). Write a skateboard company business plan with free help from the Small Business Association or SCORE websites. Business plans contain all details of your company, including profit and loss statements, planning, and will be required if you plan on applying for outside financing (i.e. asking money to your banker-see above). You will have to apply for local business permits, state tax registration, sales licenses, you will need a business zoning approval if you are opening a store. If your skateboard company will be run as a partnership, corporation or limited liability company, file the necessary papers with your secretary of state office. You have to purchase tools, supplies and equipment needed for your specific type of skateboard operation. You will be required to furnish your state sales identification number and other information to open a wholesale account. If you open a shop, be ready to buy a lot of boards. Most of them will not sell and you’ll keep the inventory in your garage for ever. But see the upside: the in 20 years, you will be able to sell those vintage boards thousands of dollars on E-Bay (if the termites have not eaten the boards). Prepare a work space in your filthy basement or rent a store or warehouse space. If you are manufacturing or assembling skateboards for resale to skateboard shops, a warehouse, garage or basement space is fine. If you will sell at retail, you will be required by your local government to have a retail store. You will have to purchase business liability insurance to protect you, your business assets and your customers in case one stupid employee wants to ollie from the roof and break his neck. Yeah, you are liable for that. But, don’t be discouraged, skate companies are stronger than ever and their HR specialists are as busy as hell. Now, how do you think you can find a job like that? Again, go to the internet. 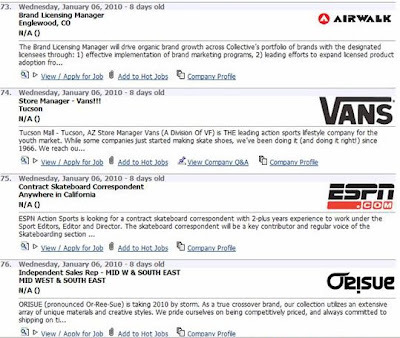 There are a lot of job websites that specialize in action sports. 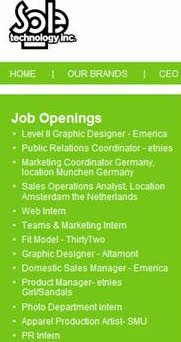 Boardsportjobs.com is a ingenious website that have job listings for skate, snow and surf. 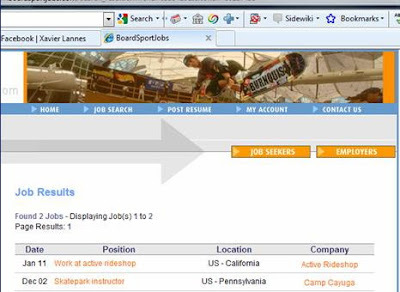 Boardsportjobs.com was established in 1989 in conjunction with the Surf Industry Manufactures Association (SIMA) to serve as a tool for finding and recruiting talent for its member companiesand represents the interests of America's surf industry and is designed to help it grow. SIMA members include manufacturers and distributors of surfboards, surf apparel, wetsuits, bodyboards, eyewear, footwear, accessories and other products used by beach and board sports consumers as well as magazines, exhibit companies, video companies and surf industry vendors such as banks and insurance companies. 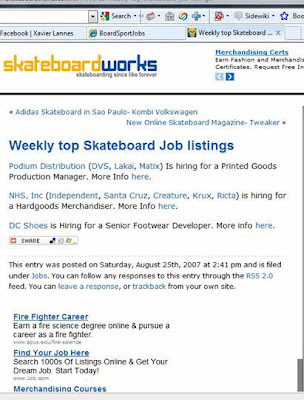 Skateboardworks.com has a selection of job listings. Every week, they have a page that list the best available jobs in the skateboard industry. 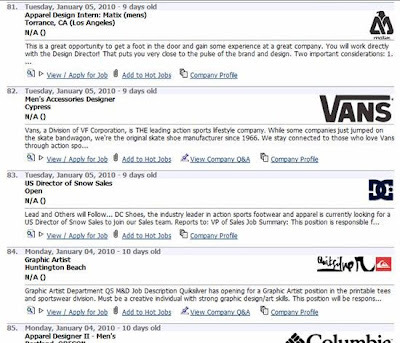 Unfortunately, the job post are sporadic, but still, if you are looking for a job in the skateboard market, it doesn't hurt to see what you see. The best of all skate job board is Malakye.com. Every day of the year, Malakye.com list about 200 dream jobs from the best of the best skateboard companies: DC, Sole Technology, Flip, Dwindle, Vans, ESPN, Matix, Skatera, LRG, Element, Deathbox, DVS, Volcom… Just name your best skate company, Malakye has a job with them to offer you! Finally, you can go and check your local skateshop or each company’s website. There are at least 200 big companies from Alien Workshop to Black Label to DVS to Zoo York, so checking them all will probably take you one full day, more if you need to send a resume but that’s worth it. You will find below the list of the major skateboarding companies. Great article. Excellent writing. I love to read articles that are informative, Thanks for a nice site. I like skateboard shoes, its my lovely game. But i wanna introduce you about Etnies shoes. They are very famous, because low-cost, high quality, fashionable and perfect. It is nice site. Lot of information here. I like it.I just say thank you for providing.